Bicep injury pads. Attaches to shoulder pad cups. White Belgian Rubber encased in white nylon mesh. SPI: Shoulder pad insert. Used under shoulder pad for extra protection against injury. 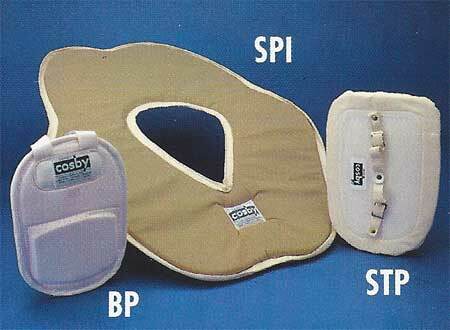 STP: Sternum pad. Attaches to front shoulder pad laces. One size fits all. BP·MC (not shown): Bicep injury pads. Attaches to shoulder pad cups. Miracle Cushion Rubber encased in white cravenette.